John JOYCE (1615 – 1666) was Alex’s 10th Great Grandfather two times over through his son Hosea and his daughter Dorcas; he was two of 2,048 in this generation of the Shaw line. John Joyce was born around 1615 in Derbyshire, England. His parents and origins are not known, but he may have come from the vicinity of Mickleover, Co. Derbyshire, England. He married Dorothy COCHET. He lived first in Lynn, MA by 1637, then Yarmouth by 1645. John died 21 Dec 1666 in Yarmouth, Barnstable, Mass. Dorothy Cochet [Cotchet] was born 16 Oct 1608, Mickleover, Derby, England. Her parents were William COCHET and Margery [__?__]. Dorothy died 12 Jan 1679, Yarmouth, MA . “John Joyce removed from Lynn to Sandwich in 1637 and became a proprietor there 1638, and thence to Yarmouth in 1643 where they settled with their children in the Hockanom area halfway between the town and Nobscusset. He was listed one of fifty “later-comers” to Yarmouth. “Within four years fifty others from Lynn, Duxbury and Plymouth came, many bringing their familiess, and the ‘three-score,’ as permitted, appear on the proprietors’ records in 1641. The fifty later comers were: . . . John Joyce . He was said to have been born “probably in the vicinity of Mickle, Derbyshire, England. He married, probably there, Dorothy Cochet. The first record we find of him is among a list of the fifty townsmen of Sandwich who have taken the Oath of Fidelity (Plym. Col. Recs. 8:184). . . . The will (dated 5 Sept. 1657, proved 5 April 1658) of Robert Cochet of Mickle, Countie Derby, Gentleman, gives to ‘my sister Dorothy Joyce, wife of one John Joyce of England, or to their children, in my sister, their mother, be deceased, the summe of five pounds (see ‘Clues from English Archives’ (New York Gen. and Biol. Rec. 41:9]). The authors of the article just cited note that the legatees named in the Cochet will were the John Joyce and wife Dorothy of Yarmouth, and this identification is accepted also by Belle Preston in her excellent ‘Bassett-Preston Ancestors’ (1930) but no one seems to have exploited this clue in England. The fact that Robert Cochet is called ‘gentlemen’ would suggest that English records may be promising. No other John Joyce appears to be of record at the period in New England although a Walter Joyce, with wife and family, were early settlers in Marshfield. Abigail, one of his children, was taken to Mr. Lothrop in Barnstable for baptism in 1646, but there is no reference to any disagreement with the Yarmouth church. It may be that no new minister had been settled at Yarmouth at that time. The Joyces tended to have more daughters than sons and the name died out in the town with the death of Jeremiah Joyce in 1735. 7 Jul 1638 – At Court of Assistants, John Joyce is granted ‘a parcell of land.’in Sandwich No indication of size. 6 Apr 1640 – Division of meadow lists among residents of Sandwich was discussed by the court. There’s a list of those who received land ‘betwixt Moonoonenescusset and Shaume.’ John Joyce received 2 1/2 acres. Parcels reanged from 28 acres to one. 2 Jun 1646 – John Joyce constable Yarmouth. 3 Jun 1652 – John Joyce surveyor of Highways, Yarmouth. 7 Jun 1653 – John Joyce on Grand Inquest. 6 Oct 1659 – John Joyce one of these who ruled on the death of Mary Chase of Yarmouth. 3 Jun 1662 – John Joyce surveyor of highways, Yarmouth. 5 Mar 1666/67 -Letters of administration granted Hosea Joyce to administer estate of John Joyce, deceased. The witnesses were Thomas Thornton and Anthony Thacher. 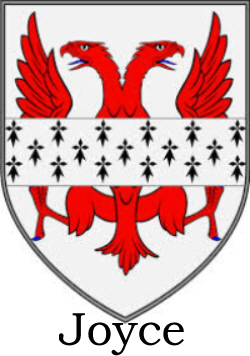 Dorothy’s father William Cotchet was born 1576 in Mickleover, Derby, England and died 13 Jun 1635 in Mickle-Over, Derby, England. He married Margery [__?__]on 1607 in Mickle Over Derby, Derbyshire, England. “English Wills: . . .Robert Cochet of Mickle-Over, Derbyshire, gentleman, sister Dorothy Joyce, wife of John Joyce of New England, 1657, proved 1658. Wootton 128. Mary’s husband Joseph Hall was born 14 Jul 1642. His parents were John Hall and Bethia [__?__]. 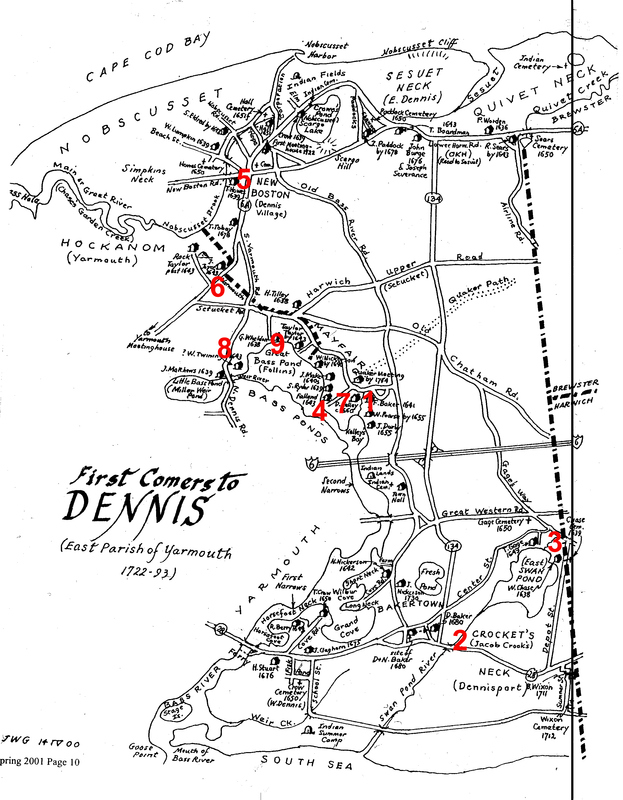 John died in Jun 1716 – Yarmouth, Massachusetts and is buried in Hall burying ground, Dennis, Barnstable, Mass. Maybe Mary went to live with her niece Mehitable Joyce Storrs in Marshfield, CT after Joseph died. This entry was posted in 12th Generation, Double Ancestors, Immigrant - England, Line - Shaw and tagged Yarmouth Pioneer. Bookmark the permalink.